Fun fact – in Kindergarten my parents dropped me off late so many times that they threatened to hold me back a year. I do not come from a very punctual family. In fact, my Grandma, mother to 5 boys, has always told them to come to family gatherings a half hour before she wants them there, that way everyone is only 10 or 15 minutes late. There was once a time when I was chronically early to everything – a result, I’m sure, of my dad coming late to just about everything and anything. And then I had kids and I don’t know about you, but inevitably 3 minutes before I have to leave, one boy needs the potty, the other lost his pacifier, and the dog absolutely NEEDS to go out. Which means these days I’m usually late for everything. 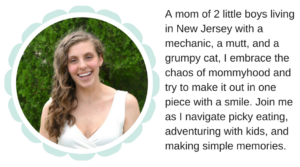 And to be honest, besides the occasional pediatrician visit, it’s never been an issue because as a SAHM we’re mostly on our own schedule. 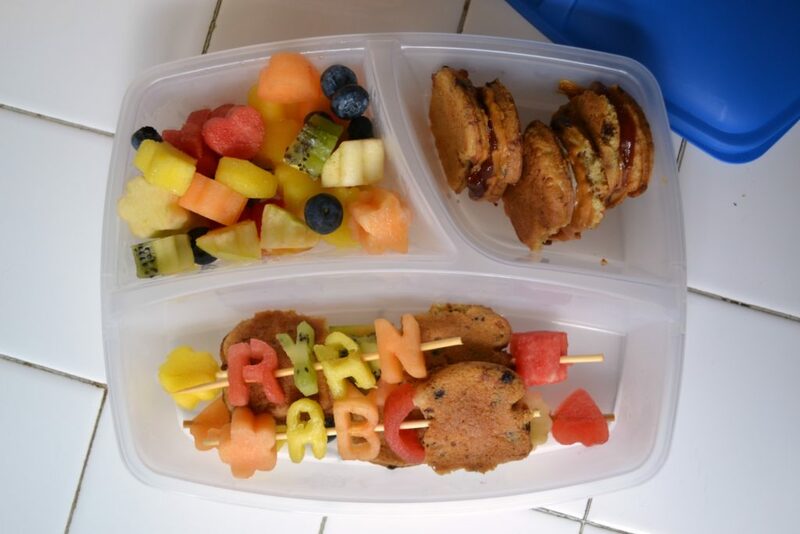 Except in the fall, Ryan starts preschool. Which means we’ll have somewhere to be early in the morning. Which means I’ll have to get 2 boys fully clothed and fed and out the door in a reasonable amount of time. Did I mention my kids are stubborn as they come? Yeah. While I’m pretty well versed in making early mornings go smoothly – mostly just making sure everything is together the night before to prevent the whole, “Oh, crud, every single pair of your pants is dirty? I guess today will just be a jammy day..” thing – I’m kind of terrified of breakfast time. We’re kind of a lazy morning crowd around here, starting the day with a snack while momma wakes up and drinks coffee before making breakfast later in the morning, so facing a rushed morning of waking and dressing and getting stuff together and then eating and whatever million other things I’ll end up doing kind of scares me. Until one of the lovely ladies at the preschool mentioned that we could bring Ryan’s breakfast with us and let him eat there. DING DING DING. Yes, please. So I’ve been trying to concoct some fun breakfasts I can put together the night before or in the morning before the boys wake up and the chaos starts. 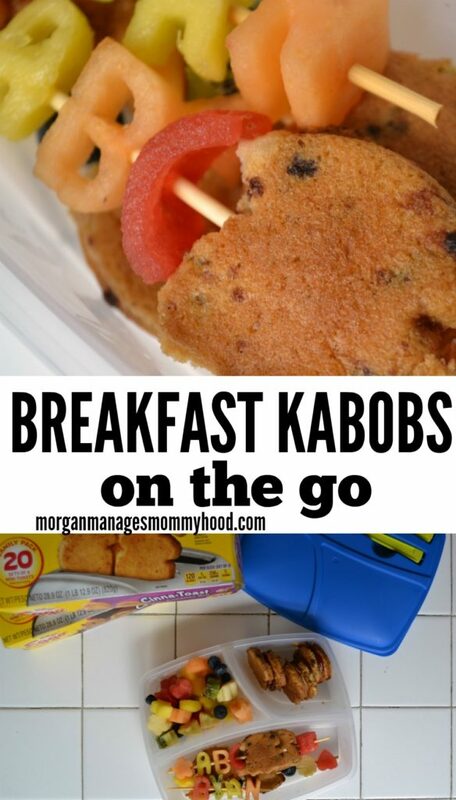 You all know that I love to put a bit of a fun spin on the boys’ food when possible, which is how I landed on these super fun Breakfast Kabobs that travel well and are sure to please all of your hungry monsters. The how-to is really simple. 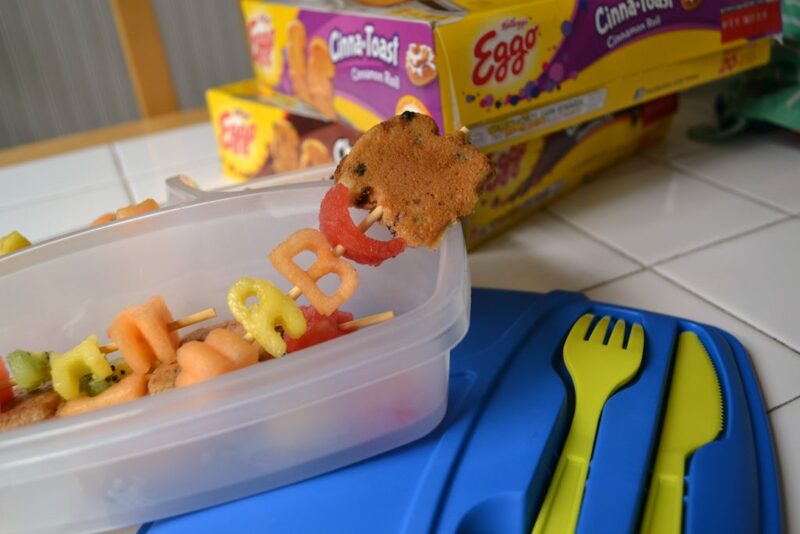 Cut up fruit, skewer it onto wooden kabobs alongside your favorite Eggo treats, cut the stick to fit inside your container, rinse and repeat. Except, as always, I added a bit of fun to ours. 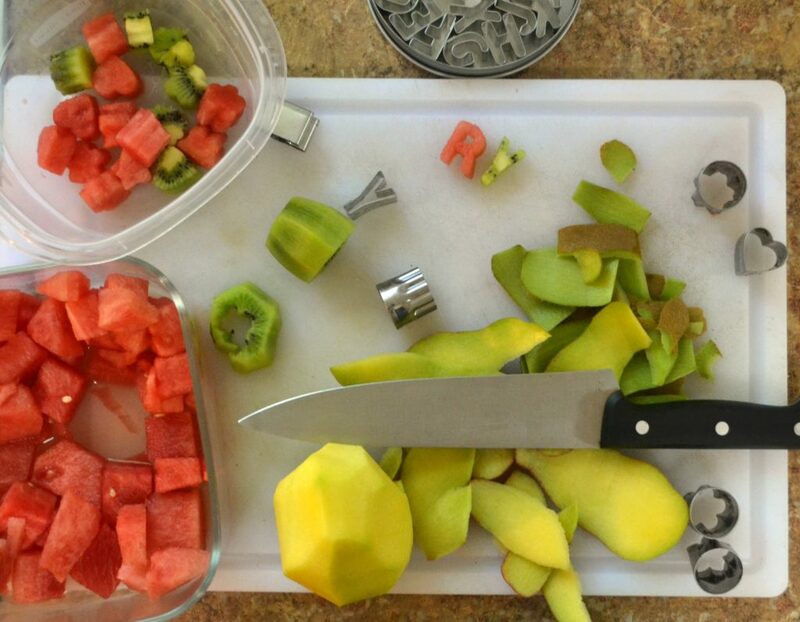 Instead of just cutting the fruit (which you can totally do if you’re short on time!) normally, I used little cutters I found online to cut them into fun shapes like hearts, flowers, and letters. Simply cut your fruit about half an inch thick (it needs to be thick enough to later skewer!) before threading through a bamboo skewer. I left the sharp end on for that part and cut it off before packing it away. To speed up the process and to make it easier to do everyday, I made a big fruit salad out of the cut fruit and then pick and chose from the big batch. For this, I used mango, apple, watermelon, kiwi, and cantaloupe, but you can really use any fruit that is sturdy enough to endure the skewer. I used the new Kellogg’s® Eggo® Choco-Toast™ Chocolatey Chip and Cinna-Toast™ Cinnamon Roll to add to our kabobs. The kids loved the taste and I loved that they are now made with no artificial flavors and colors from natural sources. 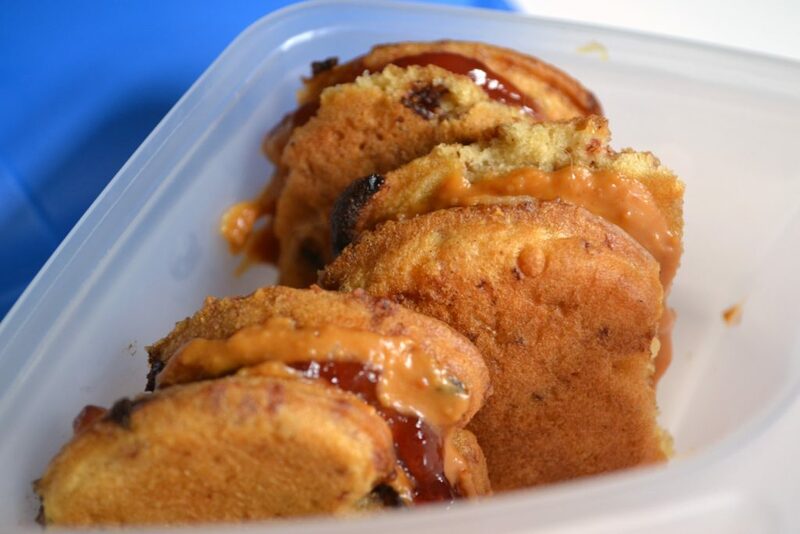 Since they are packed with flavor, there is no syrup needed which makes them perfect for on the go eats for breakfast or snacks. But, if your kiddos are like mine they won’t say no to some toppings. I made a few mini sandwiches to add to the breakfast box, including PB&J and PB and cream cheese. The trick for making the PB&J ahead of time without it getting soggy is to add PB to both sides before adding the jelly. Feel free to add more fruit salad or a cup of yogurt as an extra side to fill up your kiddos. 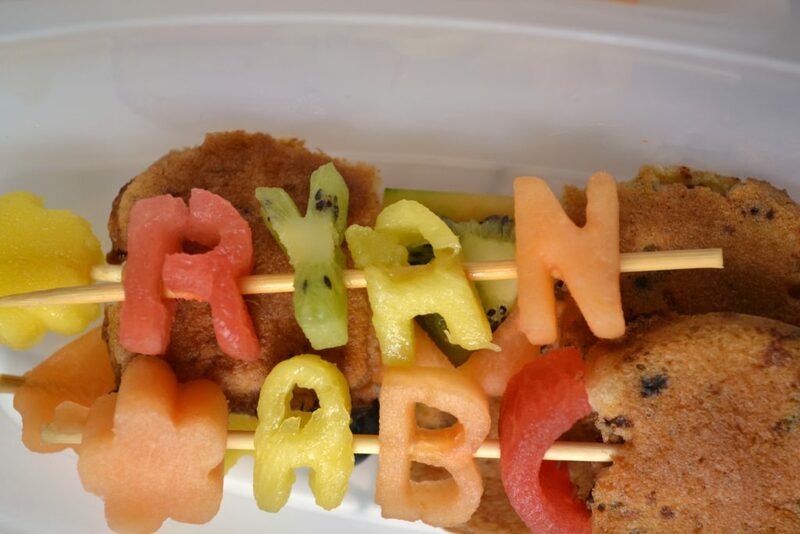 I loved using the letter cutters to make a kabob of Ryan’s name and help him learn his letters! I bought mine at Walmart – the flavors were actually in different sections of the store, one in the breakfast section and the other on an endcap if you’re looking for it. 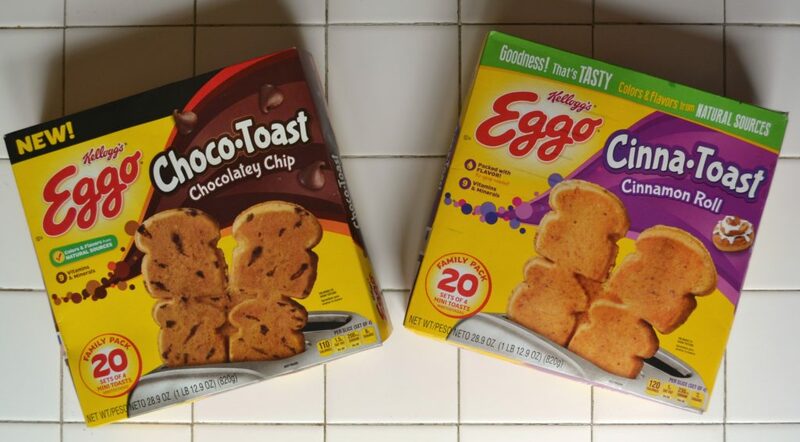 If you do grab them from your local Walmart, be sure to utilize my fave app, Ibotta to Earn $1 when you purchase ONE Eggo® Choco-Toast™ Chocolatey Chip or Eggo® Cinna-Toast™ Cinnamon Roll. So tell me – what are your secrets to getting out of the house on time? How did you prepare to take your kiddo to school? Let me know in the comments! If you are looking for more breakfast inspiration, be sure to head to the head over to the Eggo Hear the News page to learn more! Those are so cute! Honestly thinking on an adult level now about how I couldn’t use those cookie cutters for fun drink garnishes! I just love the simplicity of these. I don’t have time to have a full breakfast so anytime it’s quick and on the go, it’s great! such a fun way to have breakfast! My kids would freak out if I served these for breakfast! Totally doing this the first day of school for them! Thanks girl! I hear you about being nervous for needing to keep on a schedule. My oldest starts Kindergarten in the fall, and I have to have him at school by 8:00. Agh! Even though I won’t be sending breakfast with him, I love the idea of prepping these kabobs ahead of time and being able to pull them out fast in the morning. This is a great idea! I’m always looking for better quick breakfasts. The fruit kabobs are the cutest thing I have ever seen! 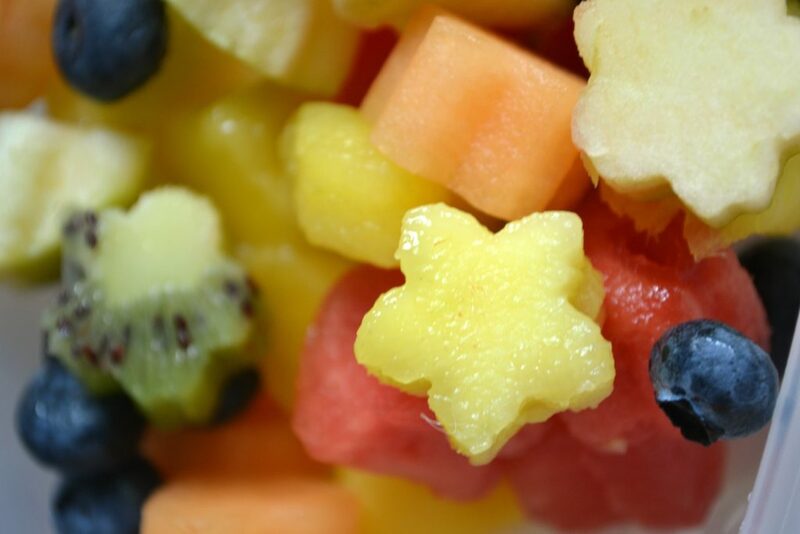 This will make even the pickiest child eat fruits happily! 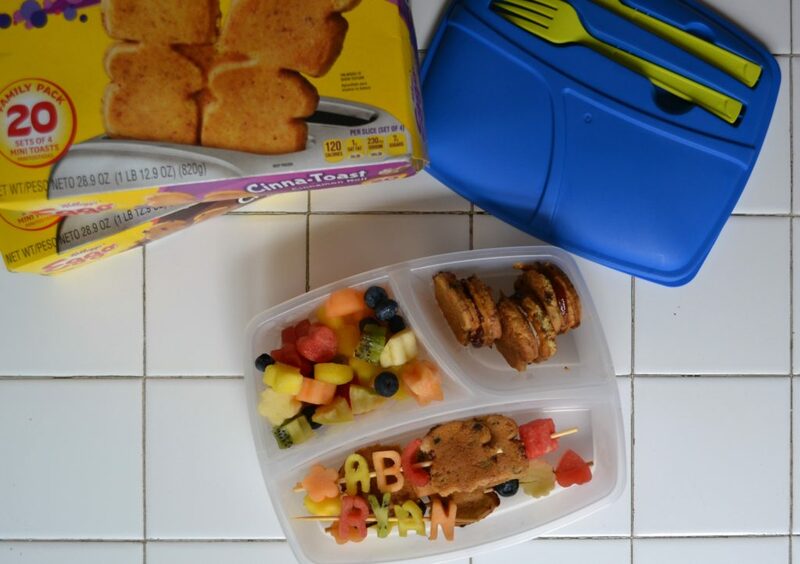 Such a cute way of packing breakfast! I’m definitely trying this for my little guy! Thanks so much for sharing! I love how you spelled his name in fruit! These are super handy! Omg what a cute little fun idea! I love that you can prep these ahead of time. I’m thankful my little is in the afternoon preschool. I would be stressed about making it on time. I pinned this!! What a great idea!!! My girls would love it!! Can we say super mom?!?! Love these and especially that they can be made ahead of time! OMG this looks like a ton of work! we did kinder for the first time in our family and it took getting used to, the early drop off! i feel ya! my fam was late a lot too!